Very few creatures can penetrate the armor of the armadillo. Help little ones to become familiar with reading and writing every day. Don't be too demanding of any child under five years of age. Just repeat the words and point out the upper and lower case letters. Gradually he or she will begin to retain the information. Talk about other words that start with the same letter. Talk about how words may rhyme with the words used on the page. Remind your young student of the shared experience both while you are coloring the sheet and practicing their writing and when you may be seeing or doing a similar activity depicted on the coloring page. 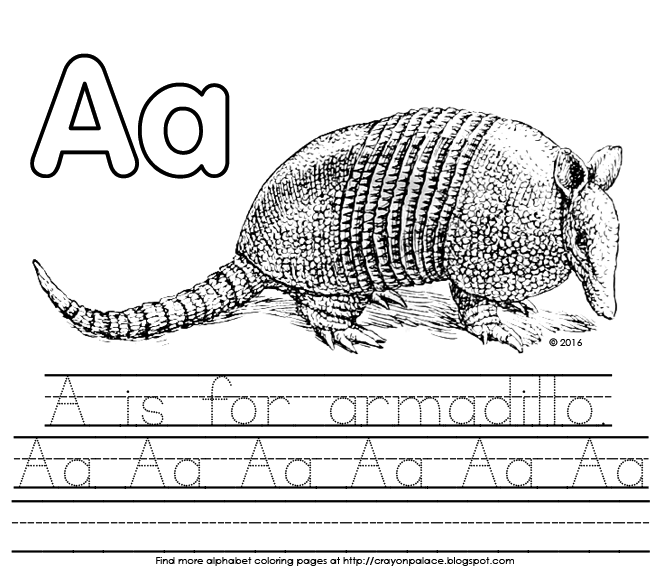 Example: "Remember when we colored an armadillo and wrote the word armadillo? Would you like to watch an armadillo in a video?" Practice coloring and writing for just a few minutes everyday; especially during mid-morning when children are most alert and do not tire as easily. Practicing regularly helps develop their small motor skills and also conditions young students for academic environments.